The land of sages and spirituality, Uttarakhand hosts the peaceful monasteries and pagodas. 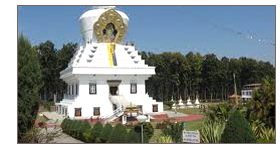 The world largest stupa of 185 ft length and 100 sq feet in width rests in Mindrolling Monastery, Dehradun. Tucked between the lower Himalayas, the monastery is an ideal retreat for meditation with its 2-acre landscaped garden. Dhamma Salila Center in Uttaranchal is a Vipassana center in the middle of 6 acre green mountain valley. A traveller can enroll for a meditation course to explore the real self in a minimalist Buddhist way at Dhamma Salila.